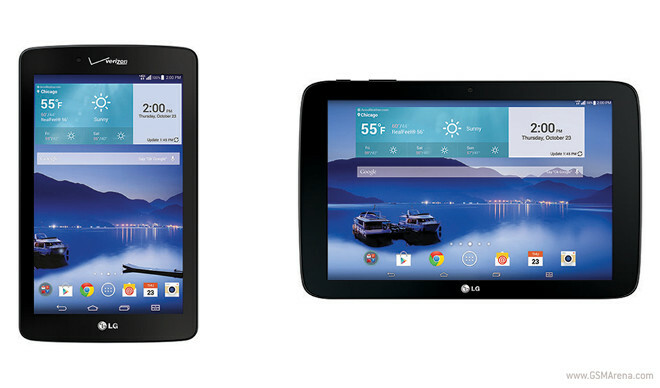 The carrier nicknamed Big Red has added two LG tablets to its roster today. They are the G Pad 7.0 and G Pad 10.1, both LTE-enabled as you’d expect. And they’re both already available to purchase from Verizon. The tablets are offered with some limited time pricing if you agree to sign a new two-year contract with the carrier. Thus, you can have the G Pad 7.0 for just $49.99, and the G Pad 10.1 for $199.99. Otherwise, their full prices are $249.99 and $299.99, respectively. And you can add either one to an existing More Everything plan for $10 per month. The G Pad 7.0, which we reviewed here, comes with a 7-inch 1,280×800 touchscreen, 1GB of RAM, 16GB of (expandable) storage, a 5 MP rear camera, a 1.3 MP front snapper, and a 4,000 mAh battery. It runs Android 4.4.4 KitKat and it’s powered by a Qualcomm Snapdragon 400 chipset with a 1.2 GHz quad-core CPU. The G Pad 10.1, also reviewed by us, sports a bigger 10.1-inch touchscreen but keeps the 1,280×800 resolution. In all other respects it has identical innards to its smaller sibling, save for an 8,000 mAh battery keeping it powered up.